In 1783, Andries Wolfferts from Rotterdam began the building of an organ. 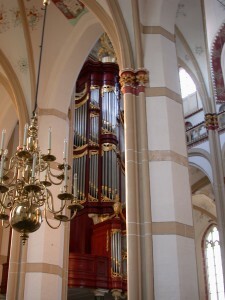 He used several pipes from the former organ built by Matthijs Verhofstadt in 1723. Verhofstadt had used older pipes also, so that we still have a late 16th-century Bourdon 8′ of mr. Peter Jansz de Swart on the great organ. The original organ had strong points, like the beautiful casework, but there were also some problems. Probably the organ had too little power for the big congregation. A.F.G. Heijneman or Heyneman was an organbuilder from Germany, but he lived and worked in Nijmegen. In 1787, he renewed the organ in St. Janskathedraal in closeby Den Bosch.In this way, they got to know his work in Zaltbommel and in 1796, only ten years after the organ by Wolfferts was completed, they asked him for a renovation and an extension of the organ. Many of the characteristic reeds are from Heijneman. Nearly all ancient organs in The Netherlands were altered drastically in the 19th century. In Zaltbommel, these alterations were limited only to the addition of a Viola da Gamba by C.F.A. Naber and the retuning to equal temperament. In 1905 the organ was changed more heavily. Amongst other things they changed the colour of the case to dark oak. After civilians disassembled the organ in 1944 in a hurry to save it from German plans to explode the tower, it was restored only provisionally by De Koff. In 1984, a complete restoration took place following the churches restoration. S.F. Blank took the situation of 1796 as a departing point, but saved also much of C.F.A. Nabers work, such as the viola da gamba. They tuned the organ to Werckmeister III, but is was later tuned to Neidhardt I. You can hear the organ below (recording Pieter de Ruijter).